When I first saw this car in person, at the LA Auto Show a little more than a year ago, I snapped a quick photo on my phone, merely for the sake of it, and it was on to the next one. That was it. I knew it was the AMG version of the new C-Klasse coupe, but I didn’t know that the car I saw was what they call the Edition 1. Look, I thought it was just plain ugly at the time. I’m almost always in favor of bold, contrasting colors, but the Edition 1 was about as close to a ricer as a German gets. I liked neither the flat grey paint nor the yellow accents and stripes. If we’re speaking strictly about design, I generally see the current-generation C-Klasse AMG (sedan and coupe forms) as a bust. I love AMG cars because they’re equal parts classy and menacing, but this iteration simply became too soft. The sharp edges of the older models have now become rounder. I used to be able to tell a basic Benz from an AMG by looking at the shape of the bumpers; now, I have to wait for it to pass me so that I can count the number of exhaust pipes shooting out the back. So here we are with the C63 S Coupe Edition 1. Edition 1 is denoted by the yellow accents and is basically a bodykit with better brakes thrown in to make you feel like you’re driving a superior performance car. Which it actually is, despite the dumbed-down exterior. Visually, it looks pretty decent from the front, but where the styling of the C-Klasse Coupe starts to fall apart is from the back. But, onto the model itself. 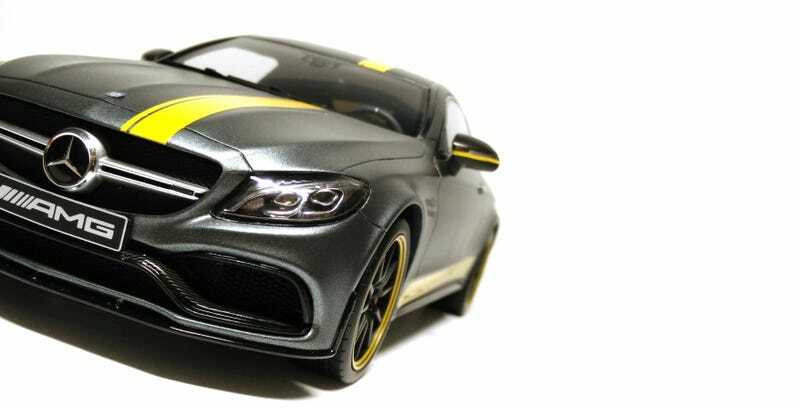 Through all the criticisms I’ve been dishing out, I’ve also secretly been wanting a 1/18 model of the current-gen C63 AMG. GT Spirit just so happens to make it in both coupe and sedan forms, with multiple colorways of each. I’ve since warmed up to the color scheme on the Edition 1 and felt it was the best-looking version released thus far. I much prefer these nine-spoke wheels over the wire/lace wheels of the other models. The paint is actually very gorgeous in person - the camera on my phone can’t possibly do it justice. The Edition 1 is a dealer-exclusive model, limited to 1000 pieces, and comes in a Mercedes-Benz branded box. American Excellence currently has them for $135 (with free shipping over $150) which, if you reach the free shipping threshold, makes it $40-50 cheaper than what you’ll find on eBay. It’s more expensive than a standard GT Spirit model, but that probably has something to do with the dealer tag. And it’s totally worth it. Go ahead, take my opinion of GT Spirit models from all my other posts and copy-paste them here. Accuracy. Details. Lots of it. Each unboxing is a life-changing event. How in the world do they make their cars so perfect?